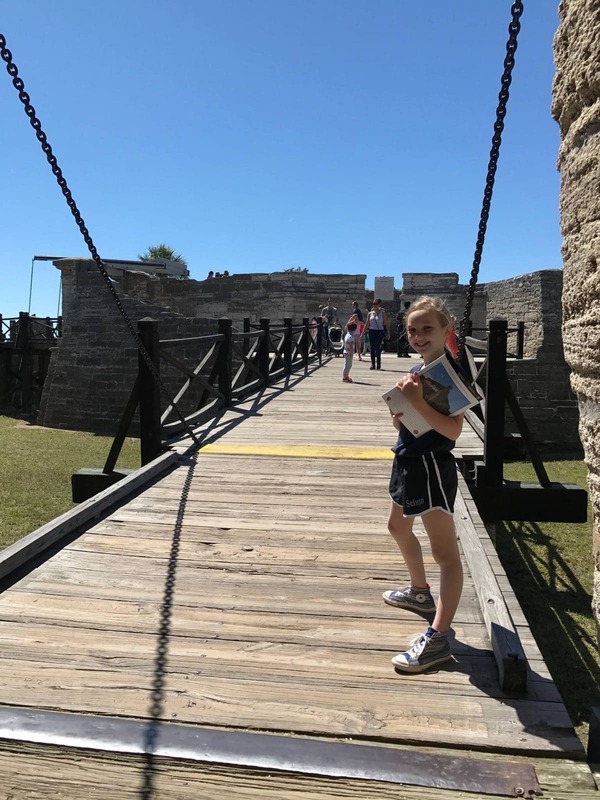 The kids and I are always looking for new road trip adventures so, when we had a few days of spring break unaccounted for, we decided to visit St. Augustine, Florida. 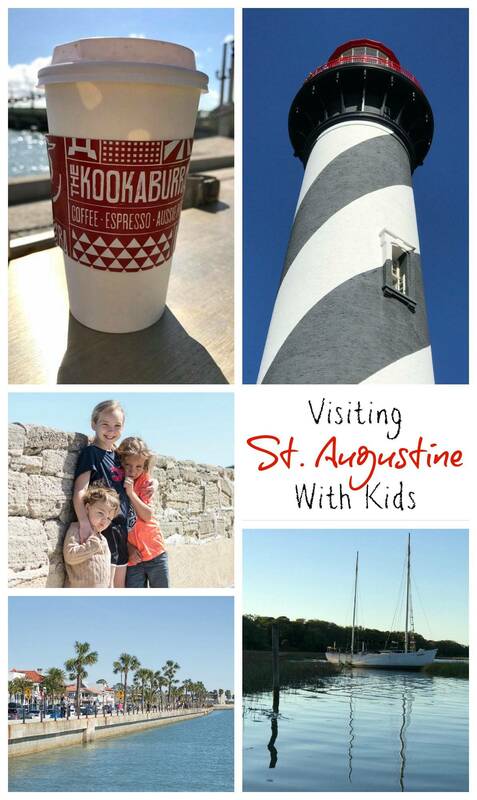 St. Augustine is a relatively short jaunt from us here in Charlotte, North Carolina. It’s about 400 miles and just over a 6 hour drive with no traffic. 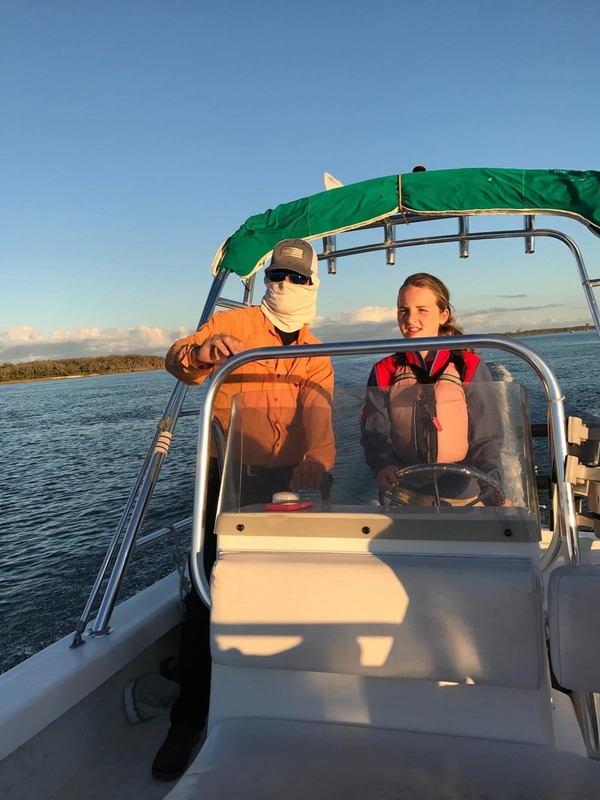 Spring can be slow to start in the Carolinas so we thought if we set our sights on Florida, we would be guaranteed sunshine and warmth. 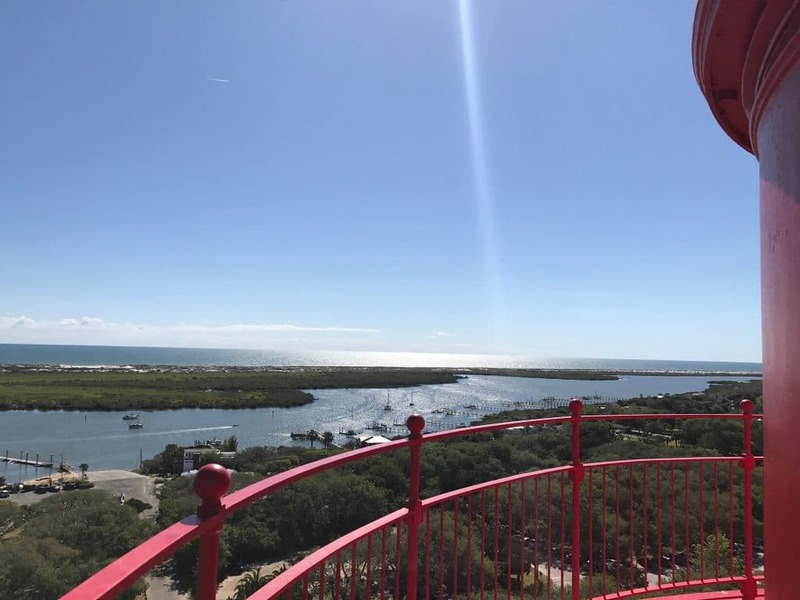 The view from St. Augustine Light House – if there is a lighthouse, climb it, right? When you travel with five kids, hotels with suites are our saviors. Two queens and a pull-out sofa is my dream room layout. Girls’ bed, boys’ bed, mom and toddler bed. Done, done, done. When we stayed in St. Augustine, we stayed at the Doubletree by Hilton in the St. Augustine Historical District. This hotel is relatively new and located just outside of Old Town. We kept our car parked in the lot for most of the time and walked or uber’d wherever we needed to go. There was also a Trolley stop across the street for anyone using the St. Augustine Trolley. There were adequate sidewalks to and from the sites and restaurants. For activities across the bridge, we drove our own car, but it was nice to stay so close to most of the action but still not feel like we were on top of the nightlife. 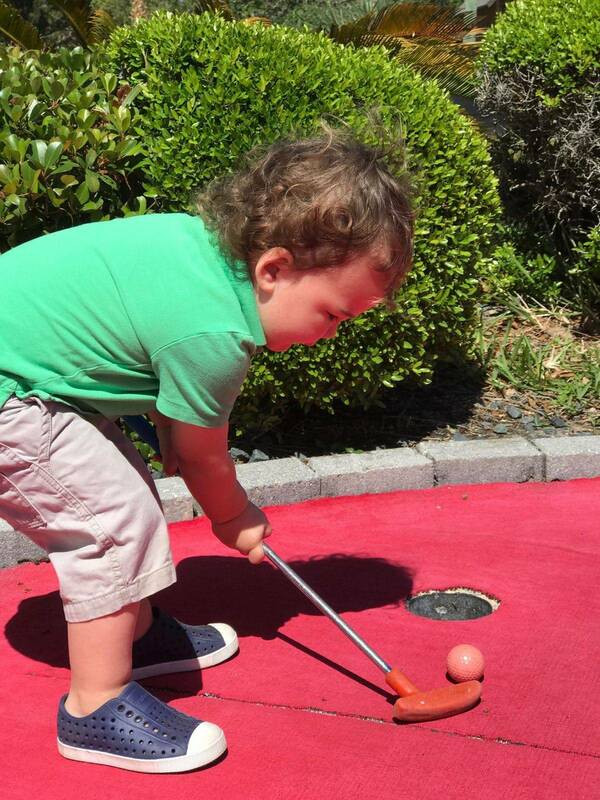 No beach vacation is complete without mini golf, right? Of course we fit mini golf into our trip! 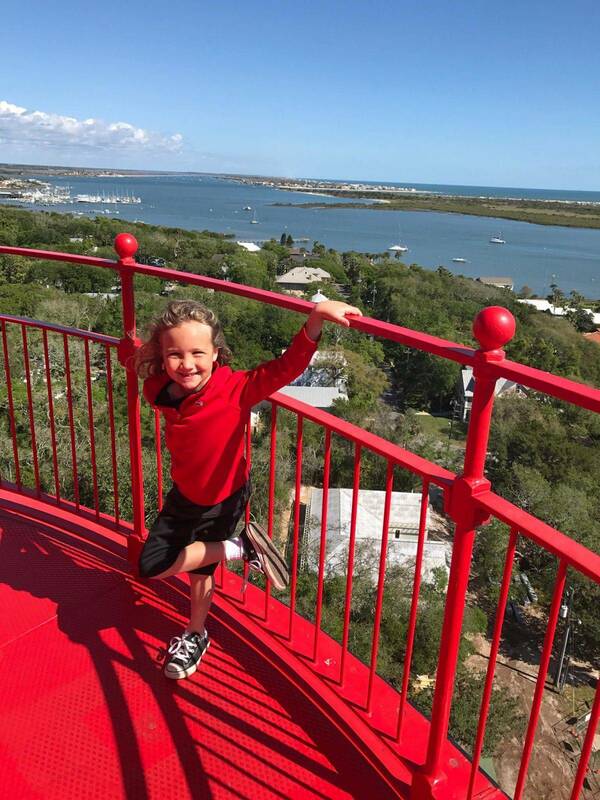 And a beach usually means a lighthouse so we climbed the St. Augustine Light House, too. Our other favorite activities were the Alligator Zoo and a sunset boat ride. 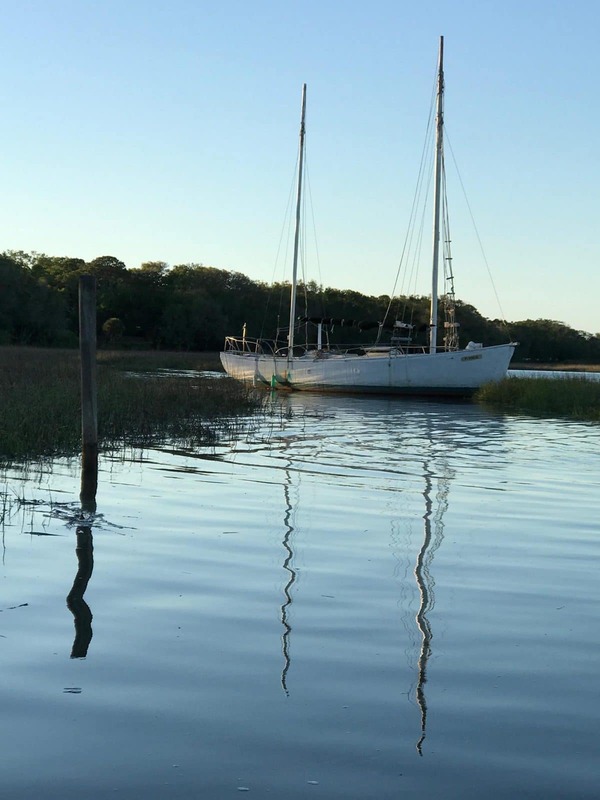 St. Augustine Eco Tours was possibly our favorite activity. We took a 6:30pm boat tour so we could catch the sunset. It was absolutely stunning. Possibly because this was a little bit off-season, we had the boat to ourselves. At the time, my kids were ages 2, 6, 9, and 12, and everyone absolutey LOVED this adventure. The boat captain was extremely knowledgeable about the ecosystem and answered all my kids’ questions with ease. He knew where to take us to spot some cool wildlife that we would never have seen on our own. This trip is a little pricey but totally worth it. Alligator Farm Zoological Park was shockingly fun! So many alligators and birds everywhere. If you have older children, they can even do a ropes course over the alligators. Hmmm… nope. But, maybe that’s your thing. 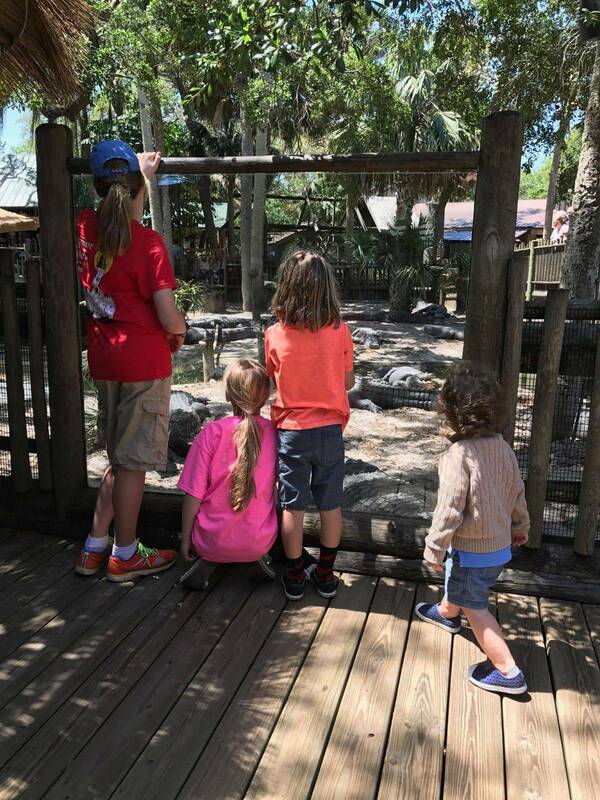 The kids and I had an excellent time wandering around the zoo and checking out the different activities they had scheduled – such as alligator feedings and information sessions. Castillo de san Marcos is the oldest masonry fort in the United States. The entry fee is small and it is part of the National Park Service. There are activity books for kids upon entering and there is so much to see and do. My children loved the live cannon demonstration and reenactment – done in Spanish! If you’ve got little people, make sure you cover their ears – it was loud. The views are beautiful and this fort was so easy to access. Just park anywhere in the area and walk on up. 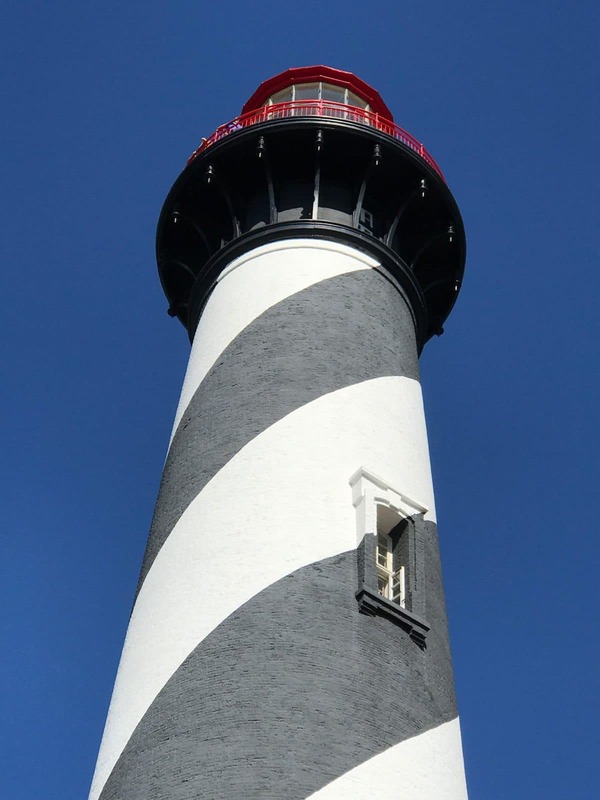 So … for the St. Augustine Lighthouse – families with little kids be forewarned! If you have an infant on your back, you cannot climb the lighthouse stairs. And, in order to climb on your own, you must be a certain height – and, guess what? The 2 year old did not make the cut. Because I was traveling alone with the kids we had to make a strategic plan. Technically, 12 years old is too young to go up the lighthouse alone but they made an exception and let the older kids go up without me while I hung behind with the littles and played, conveniently, on a very fun play area built just below the lighthouse. Beautiful St. Augustine Lighthouse – They Say It’s Haunted! When the big kids made it 219 steps to the top and enjoyed the gorgeous views, they came back down and hung out with the baby so I could take Rory up for his adventure. It all worked out in the end and we all LOVED it. Such a pretty lighthouse inside and out. Rory raced to the top! Phew! The Honey Badger – Get This. There is no shortage of delicious food to eat in St. Augustine. I had a couple of favorite spots for coffee – Relampago Coffee Lab and the Kookaburra. 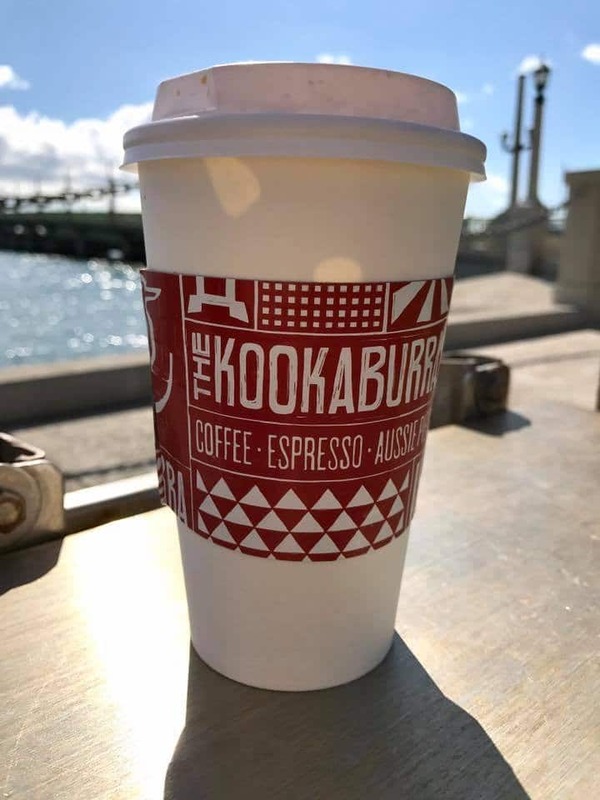 The Kookaburra is an Australian coffee shop serving Australian hand pies and a variety of gluten free options to satisfy all of us! If you are a coffee drinker, order the Honey Badger. YUM. 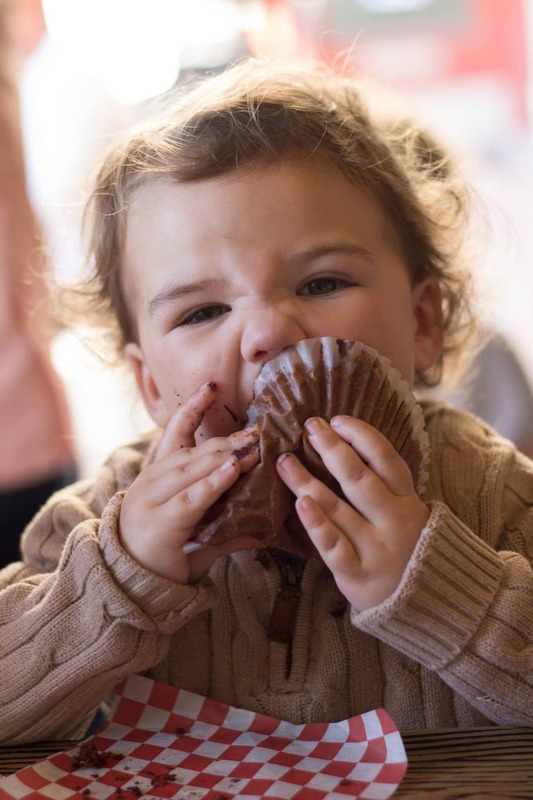 At The Kookaburra – Admit it, we all want to eat our muffins like this. For dinner, one of our favorite meals was at Harry’s Seafood Bar and Grille. They had live music playing, the atmosphere was bustling, and although we had to wait a little bit, they willingly sat our party of mainly all children. The Floridian is a great spot if you are looking for a place that tries to use local food. 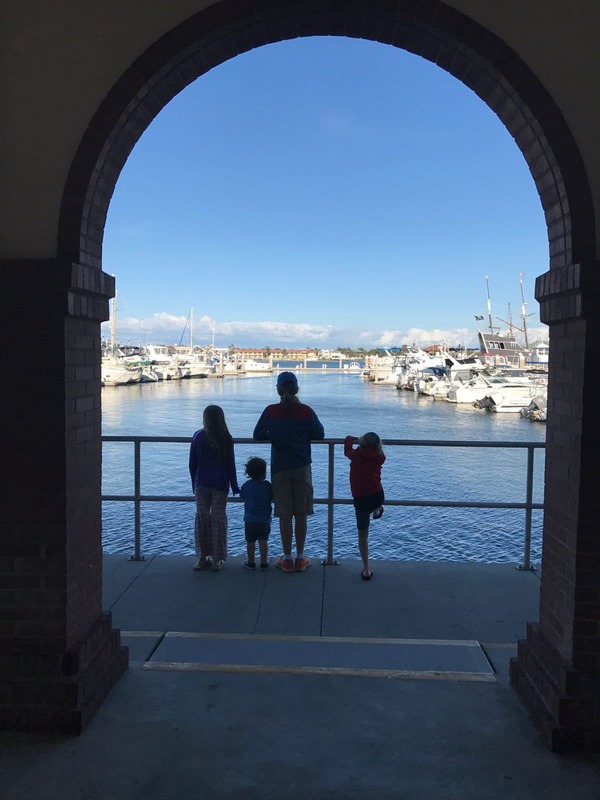 If you are from NC like us, my kids were happy to see a Mellow Mushroom Pizza – that is a reliable spot for gluten-free pizza and there is one in St. Augustine! We also love their salads. Maple Street Biscuit Company has such a great space – located right near an awesome used book store! Unfortunately, all the biscuits are full of delicious gluten so not all of us could enjoy a meal here but the staff was so nice and we all had SOMETHING delicious to eat – even if it wasn’t an amazing biscuit. If you are craving something sweet, DOLCE serves gluten-free crepes. Yep. GF Crepes. Swoon. If you have a little extra time to explore, take a drive up the coast along the AIA. We went up to visit my aunt and uncle at Sawgrass and the drive was beautiful. 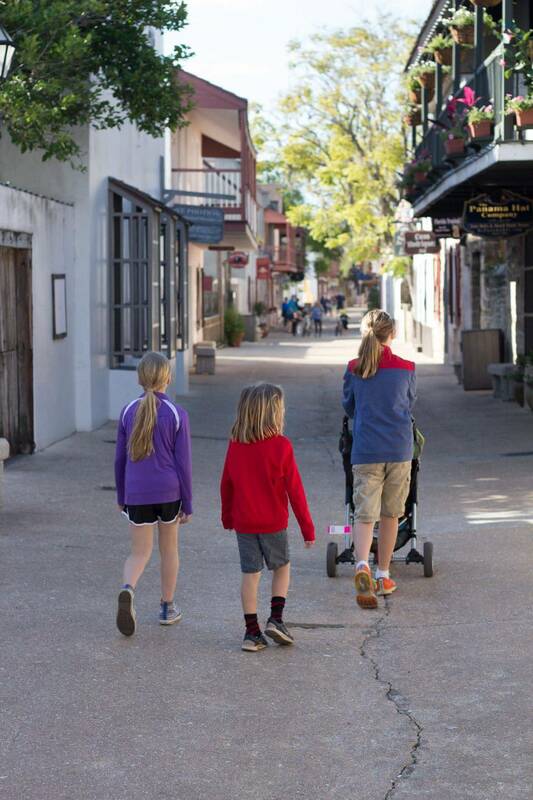 St. Augustine is a great vacation spot on its own or a nice stop on a Florida adventure. Comment if you have any MUST-SEE or MUST-EAT spots that I missed! Have fun! Wow you fit a lot in! Thanks for the tips! Biscuits for sure and the lighthouse looks fun too! It was such a fun trip and I can’t wait to visit again! Hope you had an awesome time, Jen!